Like other aspects of information processing systems, OS migration, deployment, and reimaging, and security of these processes is most effective and efficient if it is planned for and managed throughout a system's lifecycle - from initial planning through design, implementation, and operation to disposal. But does the process need to be as complex as you’re accustomed to? Are there better ways to manage it all? Are there ways to reduce time, effort, and risk when it comes to deploying and managing operating systems? 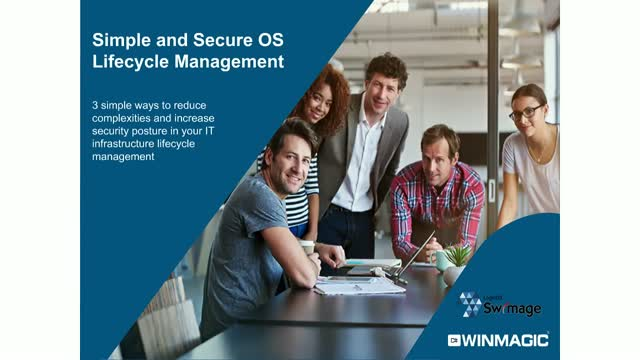 Join SWIMAGE and WinMagic as they walk through the common challenges faced by organizations in managing the OS lifecycle, and discover some of the simple steps that can be taken to reduce process complexities and security risks – all while reducing costs. Data is the cornerstone of every organisation. Join WinMagic and Bechtle at this webinar where we’ll discuss how to protect your data from endpoint to cloud. You’ll learn the steps you need to take to ensure you’re confident that your data is secure. How do you prevent the loss of secure or confidential information of your organisation to an untrusted environment or user? Have you met various regulatory requirements regarding financial, health or personal Identifiable Information to avoid risk of massive fines if a breach occurs? Join Rahul Kumar, Country Manager India, WinMagic, for a 30 min webinar and ask him why Encryption should be an important pillar of your data security strategy. Is your organization compliant? Are you still evaluating your readiness as per GDPR? Join us for a 30 mins webinar to have a quick peek into what specific steps to be taken for you to be compliant, who should be responsible for compliance, etc. And, learn how to tackle the many nuances of the EU GDPR. Join our experts for a 30-minute webinar to learn more about the tools available to reduce data security risk in virtualized and cloud environments. Let us help you get headed on the right path. Learn more about GDPR, what specific steps you should take to be compliant, who should be responsible for compliance, etc. And, learn how to tackle the many nuances of the EU GDPR. The future lies in turnkey cloud solutions like hyper-convergence, which is set to displace traditional server and storage models. WinMagic’s SecureDoc product suite, coupled with Nutanix, provides customers greater control and certainty over their data security through intelligent enterprise-controlled, cloud-agnostic key management & VM-level encryption. Join us as we unravel some of the most critical considerations for establishing a high performance IT infrastructure that is not only flexible, fluid, and affordable, but provides the consistent security and simplicity needed across your entire environment. The future lies in turnkey cloud solutions like hyper-convergence, which is set to displace traditional server and storage models. Join leaders from Scale Computing, WinMagic and Google as they unravel some of the most critical considerations for establishing a high performance IT infrastructure that is not only flexible, fluid, and affordable, but provides the consistent security and simplicity needed across your entire environment – so that you can keep compliant within increasing data privacy regulations. • Portability: Virtualization and cloud offer a whole new realm of possibilities, so why limit your business to a single platform? Learn how to securely and efficiently move data from node to node, cluster to cluster, cloud to cloud. So you’ve heard. EU GDPR is around the corner, with compliance expected by May 25th 2018. Understanding data as the core of GDPR compliance is essential to successful strategy. But where do you begin? According to Gartner, more than 50% of global companies will struggle to meet compliance by the expected deadline. So, how do you pragmatically plan for the short term without losing focus of a long term strategy? Join Simon Taylor as he discusses a data-centric approach to security across complex networks of physical, virtual and cloud infrastructure. Find out where encryption applies, and how it can help improve governance, reduce the risks of data loss, and lower compliance costs over the long-term. Employing the right data security solution for the cloud can not only help you manage this complexity, but also saves on total IT costs, and improve end-user and IT Admin experience. As we move closer to a Windows 10 world, businesses need to secure their data without slowing down their IT staff or employees. Forward-thinking businesses are realizing the security and productivity benefits of migrating to Windows 10 as drastic improvements to BitLocker Drive Encryption have made it a viable option for data protection and compliance. WinMagic's Director of Sales for Central and Eastern Europe, Daniel Reppmann, and Sales and Product Enablement Specialist, and Ryan Sanders discuss how to improve security without compromising mobility and productivity using BitLocker and SecureDoc - Together. Protecting sensitive client and corporate data is one of the most important responsibilities in any organization. So if your current solution isn’t working for all stakeholders, is it really working at all? How do you maintain the flexibility and agility required while keeping your data secure at the same time? By eliminating the need to turn down a VM in order to encrypt it, by managing your process from image to server standup and by having proper auditing and control when turning up and down VMs. Join WinMagic to learn how encryption can be deployed without disrupting your DevOps environment. Employees use cloud based file sharing services like Dropbox, OneDrive for Business to store and share files. In most cases, these file sync services are quick to install, easy-to-use, consumer services that present unacceptable security, legal and business risk in a business environment. Register for our webinar to avoid risks associated with unprotected file sharing. If there is one absolute truth in business, it’s that data is now everywhere. Big or small, companies wrestle with keeping data secure with an ever expanding mobile and agile workforce. Increasingly companies are turning to endpoint encryption as the answer to protecting their data. What are the methods that companies can use to defend access to business data? What are the costs of data breaches, compared to preventative measures like endpoint encryption? In this portion of the webcast, Mark Hickman, COO, WinMagic, discusses how you can best prevent a data leak from occurring? And how you can find the right solution to secure your IT environment? What are the 4 key considerations for establishing a smart policy for cloud IaaS protection and what is the best way to implement them? Join WinMagic to learn your role in the shared responsibility model, how to establish data governance protocols, meet auditing requirements, and implement the right level of granular policy control. What does an IT/ITES organization need to consider in its efforts to protect itself from fraud, including data breaches? These organizations need to provide assurance to customers, clients, internal stakeholders and regulatory bodies that any data being collected and processed by businesses is secure or risk massive fines, public embarrassment, loss of business, or even a closure of it. •How to manage data security on shared computing resources? •How to secure storage and transfer of data on company-owned, or company-managed endpoints? •How to facilitate the path to meeting organizational and industry compliances? •How to ease the daily burden of your data security administration functions? Financial industry is increasingly becoming the target of cyber-attacks & data breaches, despite having some of the most strict data controls. The evolving IT environment brings the Cloud into the fold, and so much more. Today, IT infrastructure is fast-moving and incredibly complex, making it difficult to secure data residing across physical, virtualized and cloud environments. But as the demand to adopt a cloud technology is ever increasing and is becoming a staple to an organization’s infrastructure, is securing the cloud a staple to an organization’s security strategy? Spend 45 minutes with WinMagic as they reveal the 5 questions that Security Professionals should ask themselves before moving to the cloud. WinMagic, one of the most respected names in the data security business, encrypts over 8 million endpoints in 84 countries. Our award winning comprehensive encryption and intelligent key management solution is the best protection against sophisticated threats and data loss. SecureDoc by WinMagic provides everything encryption, securing data wherever it is stored by enabling a unified key management strategy across any end point and virtualized or Cloud IaaS environment. WinMagic may use your contact information to send you relevant information or offers. You can unsubscribe at any time.